ESD (electrostatic discharge) static grounding clamps are used to connect electrical equipment to the ground, in order to prevent electrostatic discharge. This helps to mitigate risk by making it less likely that pieces of equipment, like devices using integrated circuits, do not get damaged by ESD, and additionally reducing the likelihood of sparks that may cause a fire. How do ESD static grounding clamps work? 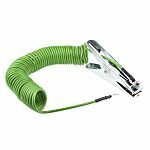 ESD static grounding clamps are composed of a length of cord that has a clamp at one end and a grounding device at the other. The clamp is attached to a piece of equipment, such as a vehicle or container, and the other end connected to the ground. The wire usually has a strong core with low resistance and an insulating cover which is protective against hazardous materials.